Couple weds during Brussels terror lockdown. 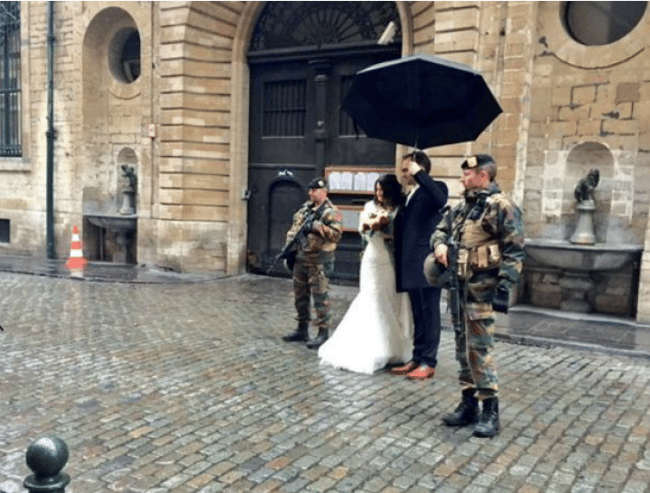 Brussels couple captured tying the knot on deserted streets during terror lockdown. The streets of Brussels are all but deserted as the city remains on the highest terror alert level, but one newlywed couple refused to let the “serious and imminent” threat of a Paris-style attack ruin their wedding day. The Belgian capital’s normally busy nightspots were quiet on Saturday night, while shopping strips, public transport, schools and tourist attractions remain closed. Aside from the heavy army and police presence on the streets, most photos coming out of Brussels paint the picture of a city deserted. But one young couple defied the warnings by tying the knot and — flanked by two heavily armed soldiers — capturing their special moment on camera. Dutch journalist Joris Marseille took his own photo of the pair in an otherwise deserted street, and posted it online, where it has since captured hearts around the world. “Getting married in #Brussels on November 21, 2015,” Mr Marseille, who later said he did not know the couple, tweeted. Brussels remains at a threat level of four, meaning an attack is imminent, as it has been since Saturday. For the rest of the country, a threat level of three on a four-tier scale remains in place. The country’s prime minister, Charles Michel, said the upgrade was linked to an imminent risk of attacks by “weapons and explosives”. Possible targets were malls, streets and public transport, he said. Mr Michel said the government would boost the police and army presence in the capital. “What we fear is an attack similar to the one in Paris, with several individuals who could possibly launch several attacks at the same time in multiple locations,” he said earlier. Armed police mounted searches in several parts of the country and arrested 16 people during a series of raids. Mr Michel said a new evaluation of the situation would be made on Monday afternoon and that everything was being done to return the city to normal as quickly as possible. This article was originally published by ABC News. It has been republished here with full permission.